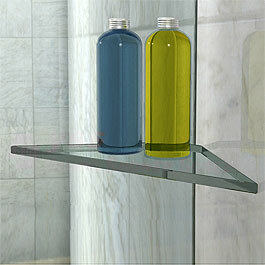 Support glass shelf, also a handy place to put shower products. 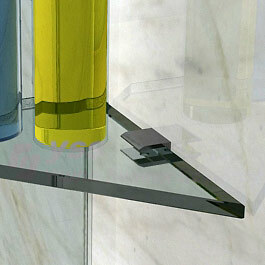 The corner bracing shelf is a simple design which is used to help create additional stability to the shower screen. Suitable for all types of fixed panel shower screen. Innovative design to place your hair and body care products on this easy to reach shelf and save storage space in your bathroom. Meets Australian Standards and has certified product stamped on glass. Silicon the two right angle edges of the glass shelf onto the shower screen and wall. Use a corner shelf bracket from wall to corner shelf and silicon from shelf to fixed panel.